One cold spring evening Arkade and Pie Face decided that the Buszy skate park in Milton Keynes needed a huge Homer painted on its wall. After recruiting a couple of helpers (Toppie and Nickos) and rounding up some Belton paints and a ladder it was game on. Completed in a relaxed 2 and a half hours the park never looked so good, and the faces of early skaters and of surprised passers-by are not forgotten. 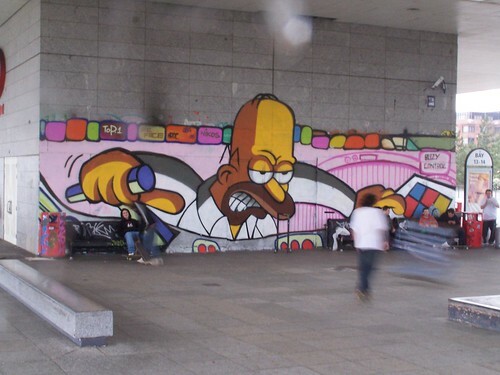 This entry was posted in Artwork and tagged Buszy, BUSZY MK, Homer Simpson, milton keynes skatepark. Bookmark the permalink.